Fibonacci Indicator NinjaTrader 8 automatic Fibonacci levels take all the guess-work as to where the price action is going. Fibonacci is a very popular tool used by traders and are based on key numbers identified by mathematician Leonardo Fibonacci. Trade any futures, crude oil, emini, forex any markets worldwide. Trading has never been simpler with our automatic Fibonacci pivots that you will be able to see where the price action is going. Easy to use and read, levels work for the entire day. No where the price is going to go from one level to next. 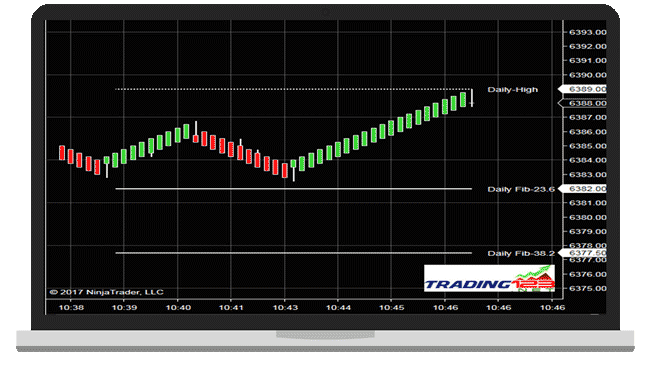 Fibonacci Pivots NinjaTrader 8 are drawn automatically and will show the markets range. No more second guessing on were to draw them. The key Fibonacci ratio is 61.8% which is key reversal area, other key areas are 23.6% and 38.2% that most day traders should watch. Other key Fibonacci reversal area is 78.6%. Fibonacci Levels are labeled right on the chart, you have Daily Support- Daily Open all key areas the market moves off. Then you have five automatic Fibonacci pivots levels that trade each and every day, and these patterns repeat. Trading with Automatic Fibonacci indicator is a tool every trader should have in their toolbox to be a successful in trading. The Fibonacci plots are very accurate in drawing the levels on your trading chart. Makes using the Fibonacci indicator alot less stressful and easier for trading. The Fibonacci levels are accurate to the tick and move with the price action. Trade Fibonacci Pivots up and down, see where the support is. Spot the resistance and watch the price action move to the Fibonacci levels. And spot the trend reversals as they happen. 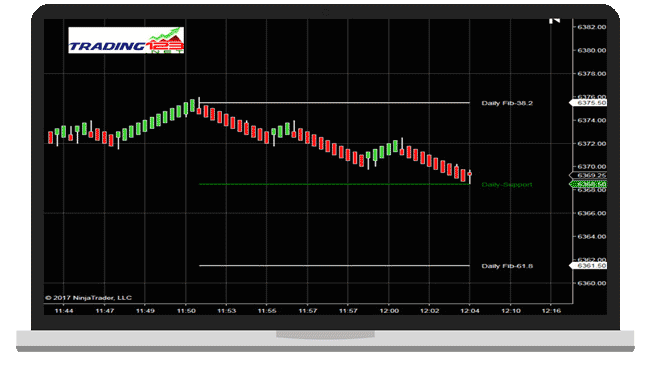 All sales are final and there are no refunds on our Fibonacci Pivots NinjaTrader 8.